Last Friday, we got news about the economy that we haven’t seen in over a decade. And despite all the worry about crashes and recessions, it was good news. For the 13th straight month, U.S. gross domestic product (GDP) was estimated to grow more than 2%. That’s according to the first estimate for Q2 growth, which was 4.1%. That’s the highest one we’ve seen since December 2014. And since then, there have been several positive trends in the economy. First, new home sales are up by 46% since December 2014. That’s a trend that keeps getting better since the housing bubble burst in 2006. Rising home sales are directly tied to the economy, because now that more people are gaining employment, they’re able to buy homes rather than rent. Second, over 8.5 million jobs have been added since December 2014. And I know a lot of people say that job data is unreliable, but there’s another employment indicator called U6. As you can see, U6 is at its lowest point since April of 2001. This was dangerously high in the recession, and it’s a big part of the “hidden employment” that isn’t included in what’s normally advertised. It’s not as low as it was before the recession, but that just means once people continue to enter the work force and get jobs, unemployment will fall even more. And of course, if people keep finding jobs and making money, it will boost the economy even more. 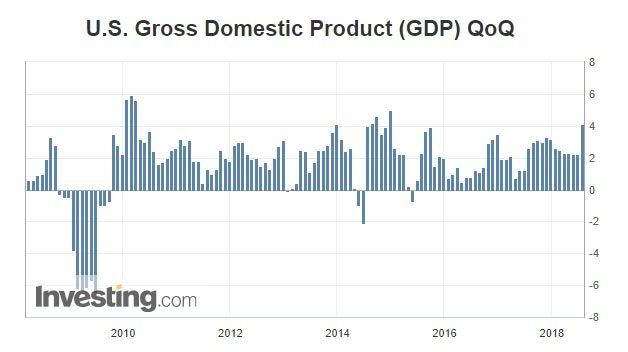 So, these 13 months of constant GDP growth of more than 2% are historically great. More people are working, spending and generally driving the overall economy than we’ve seen in a long time. And for now, none of these trends show any signs of slowing. Based on all this information, it’s a great time to invest in the United States. An easy way to buy the overall U.S. market is through the S&P 500 SPDR ETF (NYSE: SPY). And if you want to take advantage of the rising housing market specifically, I’d suggest buying the SPDR S&P Homebuilders ETF (NYSE: XHB).